Can you believe that Babar, the beloved king of the elephants from the popular children’s books written by Jean de Brunhoff and his son Laurent, is turning 80 this year? 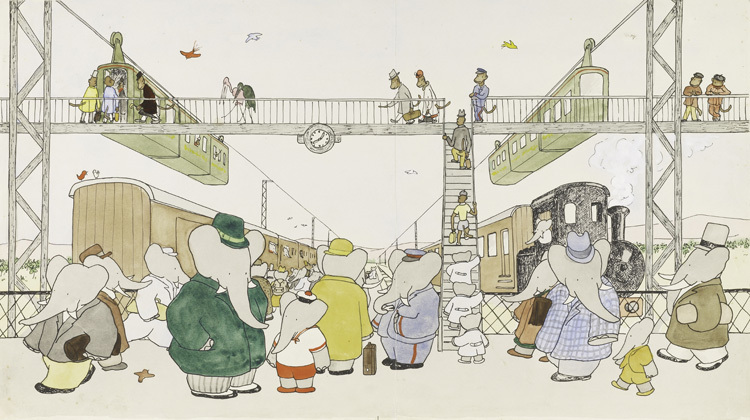 In his honor, Les Arts Décoratifs in Paris has put together a lovely exhibition of books, sketches, toys and memorabilia, drawing from great museums and private collections around the world, showing Babar’s journey throughout the years. Growing up, Babar was one of my very favorite stories, and I strongly believe it is the source of my small obsession with elephants. I especially love the simplicity of the watercolor illustrations by Jean de Brunhoff, from the little pom pom on cousin Arthur’s beret to the wrinkles of the older elephants. 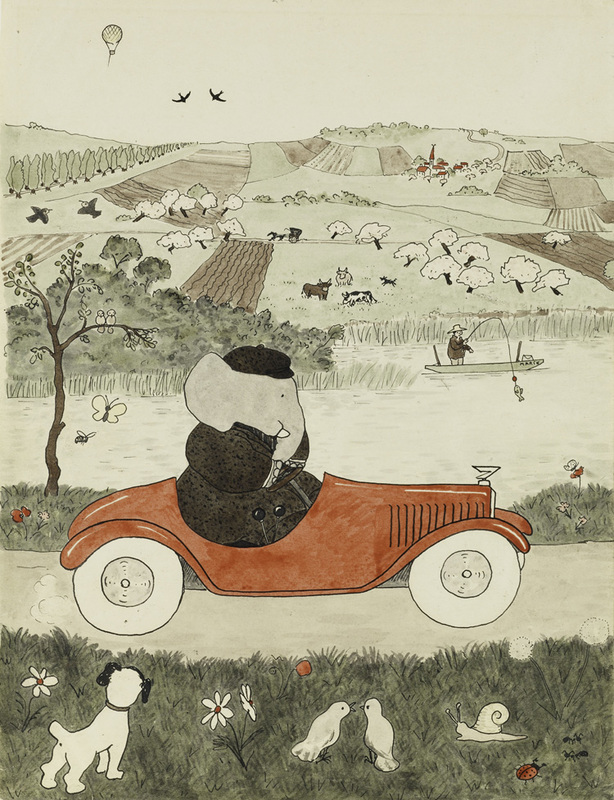 It was even better to find out that Babar was originally a bedtime story told by Cécile de Brunhoff, mother to Laurent (who was five at the time) and wife to Jean, a painter, in 1930. 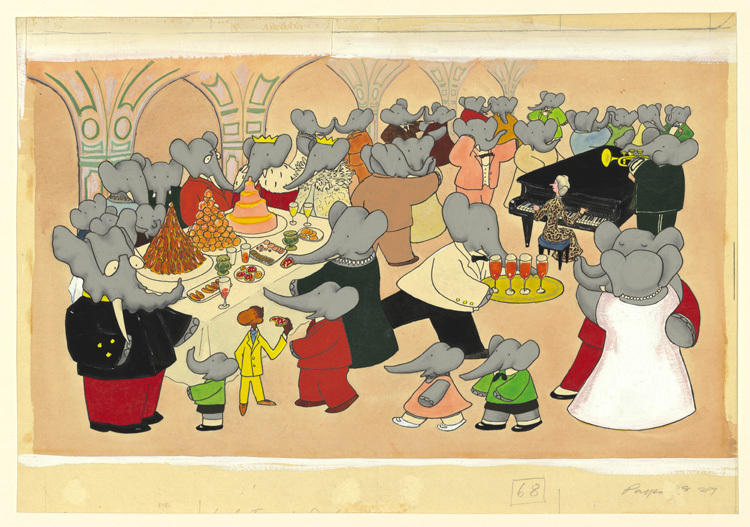 Jean, at the request of his sons, turned the story into an illustrated album that was then published by his uncle’s publishing house in 1931 as Histoire de Babar, le petit éléphant (Story of Babar), to great acclaim. Jean went on to write six more Babar books before his untimely death in 1937, with son Laurent continuing the tradition after WWII. Laurent has since added more than thirty books. 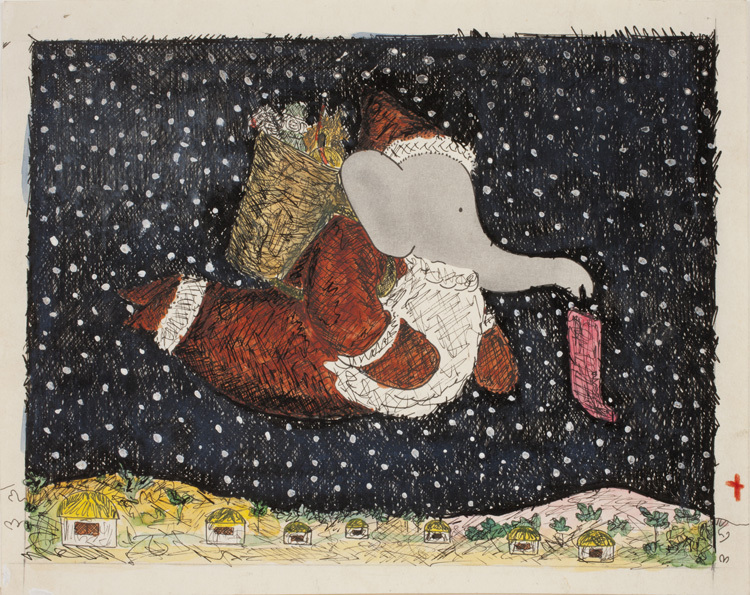 A lovely interview with Laurent about Babar, his family and his own writing. New York’s own Morgan Library — one of my favorite places in the city — has also contributed to the exhibition in Paris, and for good reason. In their collection they have the Jean’s original maquette (or first draft) of Histoire de Babar, which you can view online here with commentary and comparison to the published work. The exhibit runs through September 2012, and I have very high hopes I will be able to make it to Paris in time to catch it. If you go before I do, please give Babar my regards. Babar! I have fond memories of me as a little kid reading Babar books for the first time, and finding the experience so very magical. How exciting, that Les Arts Décoratifs is putting on an exhibition! You are currently reading Les Histoires de Babar at Les Arts Décoratifs at Quite Continental.